In both evening and morning sky, you can see Earth shadow forming a deep blue-gray belt. You’ve probably noticed it but dismissed it as delicate clouds or haze. The shadow of Earth is really big. It extends about 1,4 kilometers (870,000 miles) into space, in the direction opposite the sun. It is one of the most misunderstood and ignored Earth’s phenomenon. When can you see Earth shadow? You can see Earth shadow on any clear evening, during the twilight hours, just before the sunset. The purple-gray band of shadow, darker than the twilight sky, grows along the eastern horizon. The delicate pink shadow band just above Earth’s shadow is called the Belt of Venus. 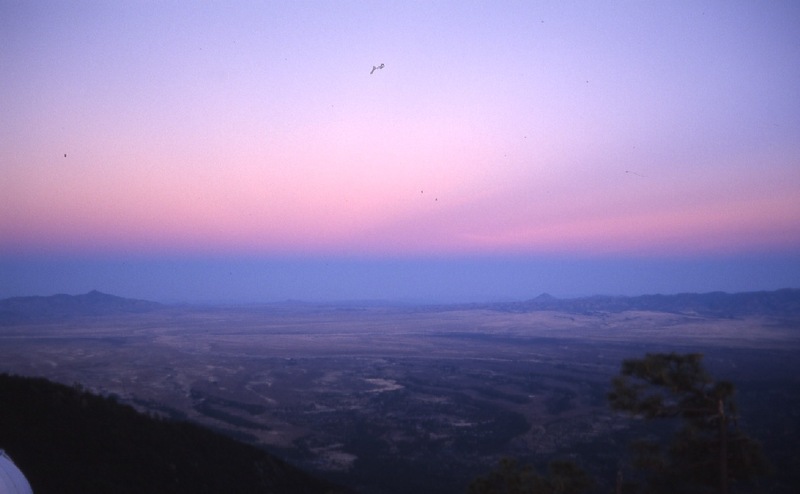 At sunrise, Earth shadow is seen in a similar way, but in the western sky. If you observe it at sunset, find the location wide-open to the east about 30 minutes before sunset. Do the same if you’re gazing the sky in the dawn, but look at the west. The blue-gray band will show up on the horizon directly opposite the Sun. 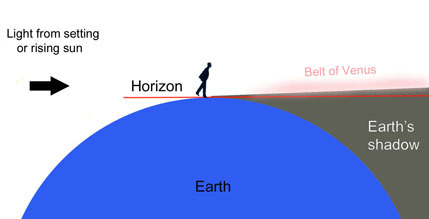 A low horizon is preferred to get a better view of the phenomena. That’s why it is best observed when is showing above the sea. In addition, the higher up an observer is standing to view the horizon, the sharper the shadow appears. Also, if you are lucky to have a window seat during a plane flight you can see Earth shadow at its most dramatic. The shadow of Earth can be seen during the moon eclipse. During a lunar eclipse, Earth and the moon are aligned in space with the Earth in between the Sun and the Moon and then Earth’s shadow falls on the Moon’s face. The shadow gradually turns a bright full moon dark in the eclipse of the moon. And what about the night? In fact, the night is a shadow. When the night falls, you’re standing within the shadow of Earth. So, next time you’re watching a beautiful sunset, look behind your back to see another true Earth’s gift.